zredbaron had the most liked content! 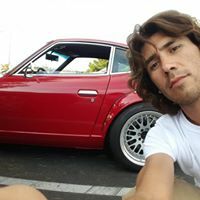 Autocross, racquetball, anything Z or car related, aviation, personal growth and inner peace. Bah! My apologies good sir. I burnt myself out trying to keep the car in working order and finishing the racing season. Tell you what... PM me and we can coordinate offline / phone call that way you aren't waiting for my presentation! No one wants that. I haven't forgotten and still plan on at least one dyno session this year with some of the data that I didn't collect last time. Evidently L6 intake data remains high on my list to contribute to the S30 community! Prior to my velocity stack hacks, I would have advised the 40mm venturis exclusively for drag/road racing (38mm for all else). If you are ok with the coin required to upgrade and possibly partially/fully mod your intake parts (three options), you will not be disappointed by 40mm venturis fitted with 47-49mm ID stacks. I apologize for being vague. (I want to make sure I have my notes in front of me.) My dyno date was rescheduled, not due to my schedule. So it goes. I'm not sure when the reattempt will be. I'm racing almost every weekend until October, so it might have to wait until fall. I don't remotely lack for torque or power, so it won't impact my racing as much as a throttle cable upgrade might. I've been carrying around a folder with pages of my jet settings. I need to organize it and figure out how to best present the highlighted data. I'll deliver. Thanks Jon. I was pretty much in shock all day on Friday. I couldn't believe what was happening as it unfolded. Unreal. I agree, I'd be a lot more comfortable if the inner bolts were also safety wired. rustler753, I'm running Stahl headers with 1 5/8" primaries, and 2.5" secondary collectors. The two 2.5" pipes are passed through a 20 degree merge collector, then expanded from 2.5" to 3" with 3" mandrel exhaust all the way back. Two straight through Magnaflow mufflers in series. I've been running 75F8 idle jets for the most part, with 70F8 and 80F8 also being used depending on the day and carb setup (venturis, horns, etc). Hey gang. I haven't had much time for road testing the 40mm venturis yet (let alone stacks). Still not driveable, so at present, the forecast is testing via 38mm venturis tomorrow unless I pull off a good tune tonight. I have main jets up to 245 now (!) and with 6 sets of emulsion tubes one would think a solid setup is within grasp. Attached is my tentative dyno flow chart: May 2018 Dyno R&D FlowChart.pdf It assumes unlimited time. I don't yet know if I'll be running 38mm venturis or 40mm venturis or both. At some point I will abandon broad data collection and proceed toward focused data collection. The results will navigate this flowchart, and so will the limited timeline. If half of those boxes have data at the end of the day I'd say that's a win. Any advice or thoughts here is always welcome. Ryan - The electromotive hall effect upgrade instructions are attached. The XDI 200 ($895) would meet/exceed my needs for carburetors, but if I'm going to rewire my ignition... I might as well rewire everything under the hood and integrate all of my fan controllers, etc. into one computer: the GT200 ($1,695! ), which would also be forward-compatible with sequential fuel injection one day (should ITBs ever occur on the car). That's an $1,700 upgrade for a TPS at present. For now I'll save my cash and I'm buying the Electromotive loaner XDI unit from them, so I can get out there and race! I may have built a race motor (RIP, RIP...), but I'm a driver first and a builder/owner second. I'm already late to race season as it is! Also, I road tested the 40mm venturis last night... and they are not yet drivable or able to be dynoed. At first I was discouraged, but then I realized this might mean that they have more power potential than I realize. It must be tuned. With 40mm venturis installed, it was way lean. I was afraid to touch the pedal to get past the "iffy" airflow and into the WOT performance where it was happier (but not happy). In the end, my largest main jets (205) aren't remotely close to being big enough. Choking the Air Corrector down to 145s still wasn't enough for an AFR that didn't make me nervous as all heck. So... in my mind this means one or more of a few things: Loss of aux venturi signal The Weber book notes that jumping from 38mm to 40mm venturi will result in a loss of signal at the aux venturi. I haven't read much carburetor theory about the aux venturi, so I'm not fully sure how this impacts WOT. My impression is the aux venturi serves to assist mixtures at low RPMs and lesser throttle positions. My impression is this is a less desirable drivability issue, but a drag or road race engine would like it just fine! The main jets are just too damn small. More air needs more fuel, duh. More fuel means more power, duh. I would love this to be the fix! Emulsion tube experimentation is in order See aux venturi notes... it's my understanding tubes are for mixing at low RPMs, not WOT. I have 5 other tubes. "Ram" tubes / velocity stacks are now crucial That's the point of Friday, after all... but if I can't safely get on the throttle I have to test at the 38mm level. Cleaning up this increase of air may clean up the signal loss at the aux. venturi. Today I will order more main jets. I'll do more road testing as I'm able. Any experience with 40mm venturis out there? Thanks Ben! About the T3 stacks - I have both their 47mm and 49mm ID varieties. Do you know the ID of your setup? Since the (Weber) sleeves have an ID of 48mm, the T3 stacks are an exciting wild card to me, because I can also test with / without the inner (Weber) sleeve inserts that will be cut. When I have more time I'll post a table of the impressive list of combinations I will be able to play with. More than I will have time. Fun! Ryan - it's truly my pleasure to share. About the ignition upgrade - I will be calling their tech today. It's not an option for this week or maybe this summer... but I'd love to incorporate a throttle position sensor. I believe that means a TecS is a good option? Not sure. I owe the tech a call about the loaner unit anyway. Would allow software to map both throttle position (TPS) and manifold pressure (MAP). That'd be awesome to pair with carbs set up for WOT but retains driveability across a 5k+ RPM band. I think it can be done. Between fancy fuel, fancy ignition and fancy head work... I think one can have their cake and eat it too. But they might have to have fancy intake and exhaust setups! LOL Speaking of exhaust, I still haven't announced some of the other upgrades. The 3" mandrel exhaust now has two straight-through Magnaflow mufflers in series after the merge collector. The first is 14" and 1/2" thick(14x4), the second is 6" long and 3" thick (6x6). The sound is very balanced. The second muffler, since it is a different shape, attenuates a different sound frequency and it just-so-happened to work out the way I hoped: it didn't muffle the tough, but it did nip the high pitch resonance perfectly. I still prefer it raw -- just remove the exhaust after the merge collector. No hood and no air filters, windows down. Just open air horns and a merge collector. That's my favorite sound. One day maybe late this summer I'll take the car to a drag strip without any exhaust attached... one milestone at a time. Thanks guys. I'll try and have an IR gun on hand. I had a chance to road tune the 38mm venturis this weekend. It has better mid-throttle response than it has had in years. 190 main jets, F9 Emulsion tubes, 220 Air Correctors. I can actually floor it under 3000 RPM! (Still have to gradually roll-on the throttle, though.) This week's plan: Monday (tonight) Install 40mm venturis (with Weber long stacks) for dyno testing Road tune 40mm venturis, write down jets, air temp, etc. Get a feel for driveability of 40mm venturis with Weber long stacks (ready for baseline dyno data) Tuesday Order more main jets if 40mm venturis are thirsty (I have up to 205 main jets) Fine-tune the throttle linkage synch for dyno testing Wednesday Road test and confirm the jetting again, if the synch was adjusted. Swap to and road test the Weber short stacks, noting if the same jets can be used. Rehearse velocity stack swaps, organize parts, etc. Thursday Backup day for final road testing Stage trailer, fuel and parts Finalize R&D flowchart Friday, May 18 - Chassis Dyno @ 9am PST I'm allowing myself to feel a little excitement. Trying to allow more.